Before the Time of the Ape, the Panther ruled over Wakanda. Wakanda - a nation as powerful as it was mysterious, tucked away in the heart of Africa where none dared to tread, save by the Panther's leave - had thrived under the wisdom of her ruler, protected by his might and by the blessing of the Goddess, Bast, a trace of which (despite the Judgement of the Spectre upon all super-powers of blood, spirit and science) still flowed through the Panther's veins. The Panther had a name. 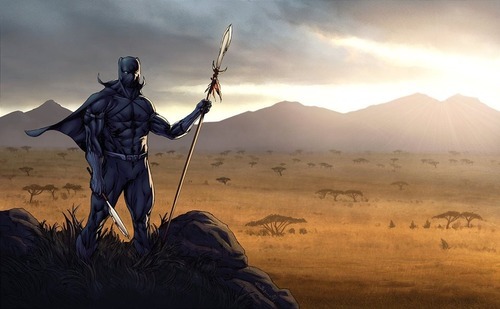 The Panther also had enemies, none moreso than the Ape - M'Baku - whose savage people had warred against the nation of Wakanda, and not merely for the source of Wakanda's wealth and prosperity: the mineral, vibranium, but also out of the sheer bestial need to conquer and possess. Many were the times that the people of the Ape ventured into the jungles of the Panther - and few there were that ever came forth again. Yet the Ape was persistent. He was driven. As the Wise Ones would say, he was possessed - but not by demons. But the Ape… was also cunning. He cheated with trickery and poisons (using also the Judgement of the Spectre to his advantage), and slew the king of Wakanda in front of his sons: the elder (adopted) Hatut Hunter, and T'Challa - who would have been the heir to the throne, had the Rite of Combat gone differently. M'Baku claimed the throne of Wakanda and began ordering the enslavement of her people before the body of T'Chaka had even begun to cool. In the year 2004, the Time of the Ape had come to Wakanda. T'Challa was forced to flee, aided by a few who gave their lives that he might one day return. Little is known of the young man, T'Challa, during the days of suffering that followed. With his father deposed - apparently by fair combat - the Elders of his people were unable to find a means within the law for the heir to retake his throne. M'Baku had been exceedingly clever, setting up his coup over the course of years so that there would be little legal - or military - support for any Panther-loyalists to help any heir return. Of course, M'Baku - known to the Western world as 'Man-Ape' - had not counted upon young T'Challa's escape, and every resource was devoted to finding the lost heir… and destroy him. 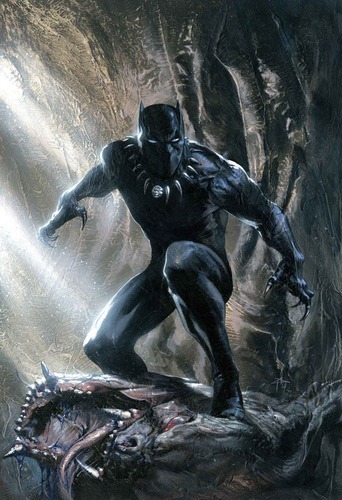 His efforts, however, were in vain - for T'Challa also was cunning, and learned - having mastered many fields of expertise in his education to rule the Earth's most technologically-advanced nation, as well as the fighting and survival skills needed to thrive in the unforgiving jungles of Africa. And survive he did. He continued his studies despite the fact that his enemies numbered far greater than just the People of the Ape - and they all wanted him captured or killed. His own adopted brother, Hatut Hunter - often just called 'The Hunter' or 'White Wolf' - seized upon this chance to rid himself of the one he blamed for their mother's death: T'Challa. She, N'Yami, had died giving birth to T'Challa - thus ending the blissful relationship Hatut Hunter had enjoyed since he had first been adopted. He pursued the lone T'Challa endlessly, among others who also sought the prince's demise. In the end, the young Panther's journeys in exile took him across the sea to a land vastly different from his own - and yet eerily similar at the same time. In the United States of America, T'Challa came as no one. Not a king. Not an exile. Not even a scientist. He set his sights upon the area known as 'Hell's Kitchen', in the city of New York, and purposed to learn more of the 'criminal mind' - partly to survive in the city, and partly to prepare himself for the Westerns that M'Baku had brought into Wakanda, to plunder her precious resources. Fortunately, the Spectre's Judgement made it impossible for M'Baku to take full advantage of his stolen resources. T'Challa - calling himself Luke Charles - found it difficult to not intervene wherever and whenever he encountered the strong preying upon the weak: even without the blessing of Bast to aid him. He found himself among certain allies - allies that helped him protect his secret. With their aid, T'Challa set up a small business - a restaurant aptly named 'Hell's Kitchen'. There, he served the community as a humble restaurateur, all the while learning of the 'dark side' of American culture. For those next few years, Wakanda was truly without a Panther to guide or protect her. Then, in the year 2009, the Spectre relented and lifted his Judgement upon the Earth. And soon after, another voice that had hitherto been silent, finally spoke. The Panther God - Bast - called to T'Challa in a dream, summoning him back to his homeland. Returning to the land of his birth - and birthright - T'Challa was forced to avoid most of his own people. None could know that he had returned - not before the time was right. Like a shadow in the jungle he made his way past the sentries guarding the Wakandan border - both the technological, and the spiritual - and found his way into the fabled ruins of Necropolis - City of Kings. But he would not do it alone. The final battle was to be T'Challa's, and T'Challa's alone - but to get him there, and to protect his people from further repercussions from the allies of the Man-Ape, he would need help. On his knees before his Goddess, T'Challa swore himself to serve her, and to serve his people - with every ounce of his strength, every thought of his mind, and every beat of his heart. Bast bestowed upon the prince her blessing - as she had done for every Black Panther before him - and T'Challa rose a new man. The Black Panther had been reborn. There was still much to do, and so T'Challa spent the next several months setting events in motion that would lead to another coup - as bloodless as any coup could be. When ready, he returned again to the United States, and made his presence known to certain heroes he felt he could trust. Surgical strikes were staged in perfect synchronisation all around the kingdom, as - one by one - the allies of Man-Ape were neutralised. In the end, nothing stood between T'Challa and the throne but M'Baku himself - and whatever cunning plans the Ape had in mind to defeat the Panther. Panther and Ape faced each other alone, in a re-enactment of the same Rite of Combat that had cost the Wakandan people their previous Panther in the first place. As before, the Ape attempted to cheat, but this time… the Panther proved the cleverer. 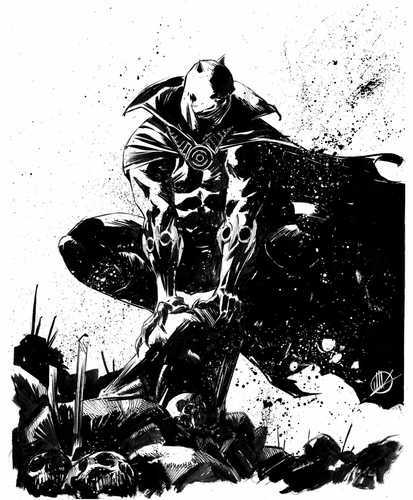 In 2010, the Panther returned to Wakanda, and by virtue of the Rite of Combat - and the blessing of Bast which had (at long last) so obviously been bestowed upon T'Challa, the young prince became a king. In the years after, T'Challa spent most of his time in his kingdom, healing the wounds inflicted upon his people by Man-Ape and his armies - but T'Challa never forgot the part that his allies in the United States of America had played in restoring him to his rightful throne. Taciturn - T'Challa will not speak unless he feels he has something to say. He is not given to 'monologuing ', neither is he one to reveal much of what he thinks or feels unless it is to someone he trusts. Wary - Following on from the first, T'Challa is not the most trusting individual - even among his friends. He is careful, cautious and methodical - and so when the time comes to act, he ACTS with precision and with purpose. King - He is a king. He thinks like a king. 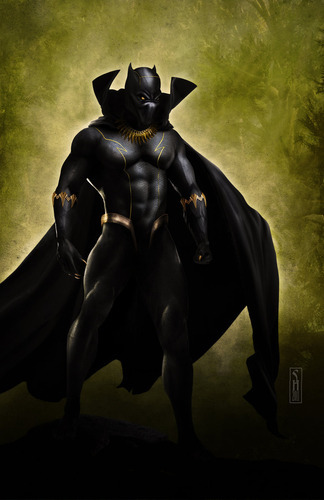 He is also MORE than a king - he has to be, in order to serve the Panther God in faraway lands (not just Wakanda). There is always a degree of grace, flair and nobility about him. Warrior - Warrior, Hunter, Champion… T'Challa embodies all these things in all aspects of his life. He is a man of action - but action without careful consideration can lead to utter ruin. The health, strength and acuity of the BODY is just as important as the MIND. Priest - Despite being one of the foremost scientists in the world, T'Challa has been raised in a deeply spiritual country, in service to an ancient deity (the Panther God). His faith is as important to him as his knowledge, and this aspect of his personality often goes overlooked. Scientist - Always search it out. Always ask questions. Always double-check. Always test theories. To T'Challa, to have a theory proven wrong is as much a step forward as to be proven right. Knowledge is knowledge. Realist - This is closely tied to both his 'kingly' side, and his 'scientific' side - T'Challa has had to make difficult decisions. Impossible decisions. And he has had to live with the consequences. He will 'call it like he sees it', even if it means causing (himself included) pain. Motivation - He has a responsibility. He swore an oath. He owes a debt. T'Challa does what he does because he can, and because he must. His people need him; the world needs him. He promised both his nation and his 'patron' (Bast) that he would be a Champion - and so he will. Goals - To bring Wakanda back into the light once more - undoing the damage done by M'Baku. To fulfil his oath to Bast, and ensure the world comes to know, respect and fear the Black Panther. To repay his debt to the heroes in the USA by joining with them, and helping them in their own struggles. Black Panther Knowledge - A key factor of his being the current 'Black Panther', T'Challa possessed the combined knowledge, skill and experience of every single Black Panther before him. This enhances not only his abilities (such as combat) but grants him a fantastic perspective upon the world, and the place and power of the Black Panther within it. Superhuman Acute Senses - Able to see in total darkness (unless it is the essence of the Darkforce), or spot a small detail a few hundred feet away… T'Challa possesses extremely keen senses - not just his sight. His abilities here might be on par with those of Wolverine, but far from a being like Superman. His sense of smell is so keen he can tell if a person is lying by subtle changes in their odour (such as increased production of sweat). Superhuman Physique - T'Challa is strong enough to lift just about one ton. His strength is above that of typical humans, but far below many super-humans (without having to go as far as likening him to Superman The Thing. Superhuman Speed & Reflexes - Whilst far from being a speedster like The Flash II, T'Challa possesses reflexes that far exceed those of normal humans. He can also reach running speeds in excess of 35mph. Combined with his cat-like agility, T'Challa can keep up with Daredevil] whilst crossing the city. His hand/eye coordination is exceptional. 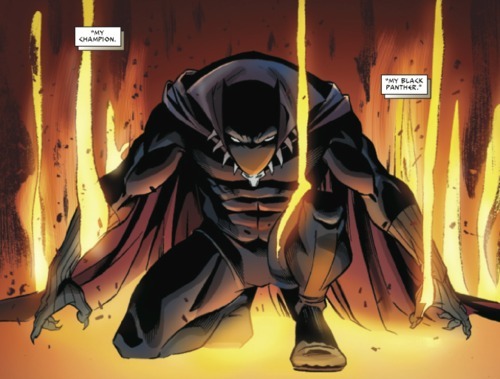 Superhuman Durability - T'Challa has not 'healing factor' as such, but given that his body is beyond peak physical condition, he has some resistance to disease, poisons etc and still recovers faster than a typical human would from most injuries. He can handle the landing after leaping from a building (within reason). RESOURCE: Wakanda - T'Challa is known throughout the world as the ruler of Wakanda, and has all the resources of his kingdom at his disposal. The superhero called 'The Black Panther' is less known and would have to be careful in using Wakandan resources. Furthermore, Wakanda has suffered considerably at the abuse of Man-Ape during his reign of terror, and T'Challa has to take this into strong consideration when drawing from his nation's wealth. Even at the best of times, he would never abuse his power. 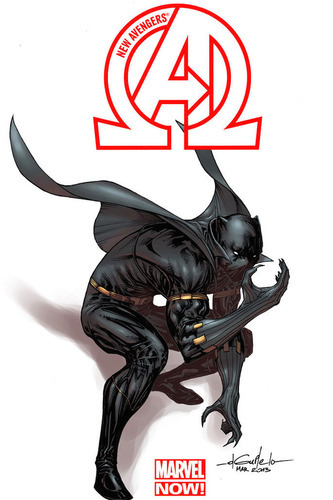 SPECIAL: Eidetic Memory - In conjunction with his brilliant mind, T'Challa's memory provides him with a mental advantage comparable with that of Bruce Wayne. RESOURCE: Kimoyo Card - A powerful and compact PDA - T'Challa's personal computer he can carry with him. Vibranium Microweave Mesh - The suit has the ability to absorb vibrations due to its Vibranium lacing. It is strong enough to deflect small arms fire with ease, as well as melee and energy attacks as well. It is extremely resistant - even withstanding punches from some of the world's toughest foes. Bullets do not ricochet off this suit; they simply fall to the ground, their momentum absorbed. Anti-Metal Claws - Also made of Vibranium, T'Challa's claws are retractable and capable of breaking down most metals at the molecular level. Needless to say, these claws are sharp. They assist T'Challa in doing his own 'wall-crawling' when needed, as well as aid him in combat. T'Challa is able to FIRE tiny darts from his claws, with various effects. Energy-Dampening Boots - Designed specifically to absorb much of the impact from long falls. T'Challa can easily survive a leap off a tall building with these boots on, further augmenting his super-strength and durability. Cloaking Technology - The Black Panther suit does more than just 'blend in' with the shadows. For limited amounts of time (several minutes), T'Challa is able to completely cloak himself in broad daylight. The cloaking fields bends light around anyone within the field (usually T'Challa himself), while his suit absorbs any sound he makes as he walks. Teleportation Technology - A rare thing for T'Challa to use, but his suit does have the capability. A single jump will send him many miles, but requires significant time to charge up. (E.G. If he knew the coordinates, he could theoretically teleport up to the SHIELD helicarrier). Energy Daggers - These are T'Challa's preferred weapons. Although he is capable of using many others, he has always favoured his twin daggers. Each one is primarily comprised of Vibranium, and capable of generating short blades of PURE ENERGY - that can be set to merely stun, or kill. The daggers are also able to fire their energy blades as darts. Each hilt is expertly crafted from ivory, coloured black, yet the blades glow pink. CONTACT: High Society - As a monarch and public figure (in particular when NOT being Black Panther), T'Challa has access to other such individuals in powerful circles. THIS IS NOT ALWAYS A GOOD THING. Many of these individuals would give anything to see Wakanda's riches made theirs - and T'Challa knows this. That said, to say he is a 'Somebody' without the mask is an understatement. SPECIAL: Diplomatic Immunity - As ruler of his own nation, T'Challa is granted diplomatic immunity in other nations. How many vigilantes/superheroes wish they had the same? Combat & Warfare - T'Challa is exceedingly well-trained in the arts of combat - not only hand-to-hand, but with a variety of weapons as well. He has adapted his fighting style (which involves myriad styles and techniques) to suit his enhanced physique and senses, to give him something of a unique approach. He could match such warriors as Captain America, Daredevil, or Batman, and even gain the upper hand at times. He is an expert marksman with most firearms, and a brilliant tactician. Acrobat - T'Challa is a master of Parkour. Combined with his enhanced strength and speed, he can navigate through a city as fast as Daredevil or even Spider-Man. Hunter & Tracker - Even before receiving the Blessing of Bast, T'Challa had been raised to survive in the wild. He can track just about anything, and with his Eidetic Memory he can recall thousands of individual scents and tell them apart. 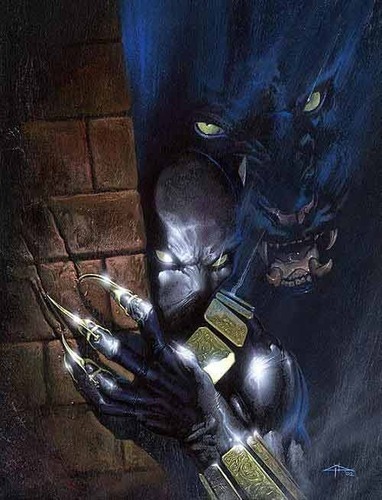 Stealth - Mastery of the shadows is a must for anyone bearing the title and responsibility of the Black Panther. 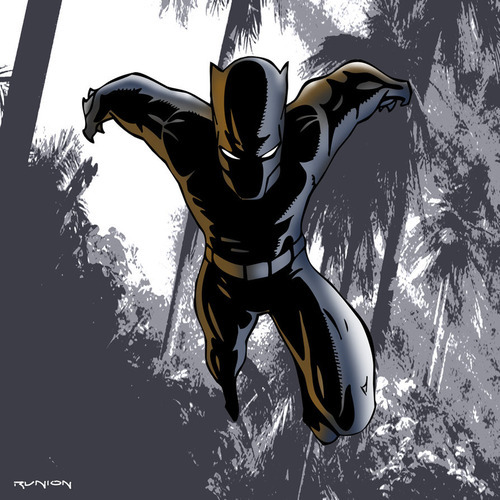 T'Challa is wily and unpredictable, a phantom in any jungle, and capable of using the terrain to his advantage. Only the very observant, or those with the right superpowers, would ever see or hear him coming. Inventor - Much like the other 'great names' of the modern age in science, T'Challa has proven to be quite the inventor. He has a Ph.D. in Physics, but he also possesses great knowledge of Alchemy as well, and can integrate it into his other scientific research. He is the inventor of a new scientific field called "Shadow Physics", which is a dangerous discipline that allows him to view, manipulate and track Vibranium on a quantum level. Multilingual - T'Challa is fluent in English, French, Russian, Italian, Spanish and Mandarin - as well as many of the dialects spoken throughout Africa. He can also read ancient Egyptian hieroglyphs, and Latin. Diplomat - To be a leader one must be more than a warrior, or tactician. T'Challa is a highly skilled diplomat and must deal with other government officials, liaisons and rulers on a regular basis. Proud - And equally as stubborn. When T'Challa sets his mind on something, he won't budge - and this works against him frequently. He is also loath to ask for help (something the Goddess is trying to teach him) and this has created difficulties for him (and others) on many occasions. Sensory Overload - T'Challa's enhanced senses are always at risk of being overpowered - extremes of light, sound, smell… can (and will) cause him intense nausea, pain, even render him unconscious. Identity - The only reason that 'The Black Panther' might be less known than 'The King of Wakanda' is that T'Challa has yet to make a name for himself outside of Wakanda as a hero. His identity is PUBLIC. If criminals are not aware now of who he is, they soon will be - and T'Challa will find them coming after his people and his loved ones with a vengeance. His being a king AND a superhero also means his attention will be eternally divided between responsibilities. He can easily 'spread himself too thinly', and others will pay the price. Distrustful - This is the negative side of being 'wary'. Much like Batman, T'Challa does not even really trust his allies, and whenever this becomes apparent to them, it hurts his relationship with them. It is not always without cause, but it is something that often proves more of a flaw, than a virtue. T'Challa, King of Wakanda - In his public persona, T'Challa is recognised by the rest of the world as the ruler of the small, enigmatic, isolated, spiritual and technologically advanced African nation, Wakanda. Few outsiders have ever seen Wakanda at all - at best, most of everything that is known about T'Challa's home is pure conjecture, rumour and legend. T'Challa is seen more frequently now on the "international stage" (such as the U.N.), striving to make the world a better place. He seldom answers questions or even acknowledges the Press. The Black Panther - T'Challa does not try to maintain a "secret identity" as such; but he also does not go around telling people "I am the Black Panther" either. There are those in the world (researchers etc) who already know the connection between the Black Panther and the ruler of Wakanda (i.e. that they are one and the same). "The Panther" has made frequent appearances around New York, recently, and appears to be building a reputation as a super-hero.